“Over 60 years ago, an annual fundraising gala was established to create a fund that our friends and colleagues in the industry can turn to, in times of need. Today the Will Rogers Motion Picture Pioneers operates the Pioneers Assistance Fund, providing aid to approximately 80 industry members per month, dealing with short-term and long-term issues. 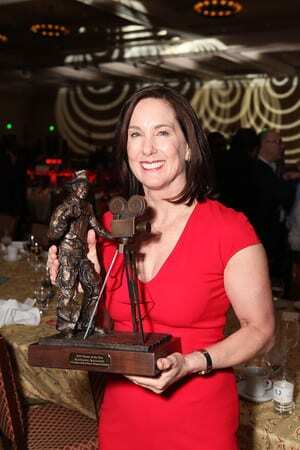 The Will Rogers Motion Picture Pioneers Foundation announced veteran Hollywood producer Kathleen Kennedy as the 2013 Pioneer of the Year honoree. The award dinner will take place in April at CinemaCon in Las Vegas. One of the most powerful women in Hollywood, Kennedy came to the attention of Steven Spielberg while working on her first film job in 1979. He initially hired Kennedy as a secretary, but kept her on because of her good production ideas. Shortly thereafter, she co-produced Poltergeist and produced the box-office smash E.T. the Extra-Terrestrial. Kennedy’s production roster includes the Jurassic Park, Indiana Jones, and Back to the Future franchises, as well as Schindler’s List, Seabiscuit, The Color Purple, War Horse and Lincoln. Kennedy has produced or executive produced over 60 films, which have received 120 Academy Award nominations and 25 Oscars, and grossed over $11 billion worldwide. Kennedy headed The Kennedy/Marshall Company, which she founded in 1992 with director/producer Frank Marshall, and in 1982 Kennedy help co-founded and ran the hugely successful production company Amblin Entertainment, with Spielberg and Marshall. She currently is co-chair of Lucasfilm Ltd.
Kennedy serves as vice president for the Academy of Motion Pictures Arts and Sciences and sits on the Board of Trustees. She has received the Women in Film Crystal Award for outstanding women within the entertainment industry and was the first recipient of Women in Film’s Paltrow Mentorship Award, for showing extraordinary commitment to mentoring and supporting the next generation of filmmakers and executives. Kennedy is on the board of the LA Fund for Public Education, as well as, she and her husband Frank generously support her alma mater San Diego State University’s School of Theatre, Television and Film.